Well friends, I got Bulletstorm in the mail today from GameFly and began playing it. I heard it was a good game from a few people and figured “Hey, Epic is pretty awesome so this will probably be worth it” and oh boy, was I right. This game features hilariously foul mouthed characters, obscene amounts of blood, a good story, and this new fangled “skill kill” system. I’m having tons of fun with it so far! I’m really looking forward to reviewing this so keep you eyes on linksaveszelda.com for the review, hopefully I will have beat the game by Saturday so the review will be posted around then. On a related note, I read today that there was supposed to be a sequel to this, but it got cancelled. Darn. Now I know I haven’t even had the game for a full 12 hours yet I’m complaining about the sequel not happening, and you all are like “wtf really?” but I can tell I will want a sequel to this. Anyway Mike Capps, president of Epic, said that they had planned a sequel at some point but decided to put the team on another project instead. The People Can Fly team was better suited for another project, even after some development for a Bulletstorm 2 had been done. It’s not off the table just yet according to Capps, but apparently Bulletstorm fell short of EA’s expectations and didn’t sell very well, so it’s not something that will be happening anytime soon. Epic Games did announce at PAX East that they have an untitled “PC-only” game in the works, though. So we will see what that’s all about while we wait. 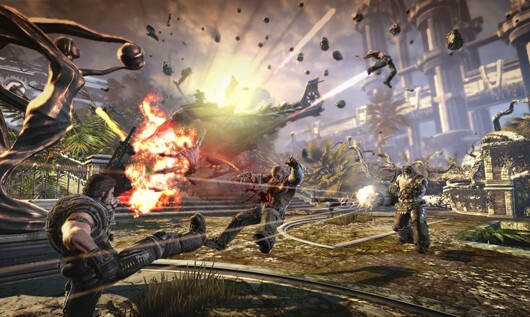 Bulletstorm as a singularity I could only muster an “its playable” attitude… but then when I compare it to the other games that are out I honestly have to say it was a big dissapointment and really didn’t deliver on what I was hoping for it. I beat it in two days and at the end I had no attachment to anyone or anything in the game. Also if your making a game based on killshots I think they should have invested a few more man hours into it so I wouldn’t have to do the same 6 or 7 over and over again. To be honest it was alot better than I thought it was going to be, well the single-player was anyway.